Easter Ross: Adult winter Little Gull and Sandwich Tern off Tarbat Ness (Dave Tanner). Sutherland: At Scourie, a Merlin, Brambling and a Little Grebe (Andy Williams). At Knockan Crag loch 6 Whooper Swans. Easter Ross: Adult Little Gull at Tarbat Ness this morning (Dave Tanner). Inverness-shire: At the south end of Loch Ashie today, 8 Bramblings and 93 Redpolls, at least one Mealy Redpoll (Tom Wells). 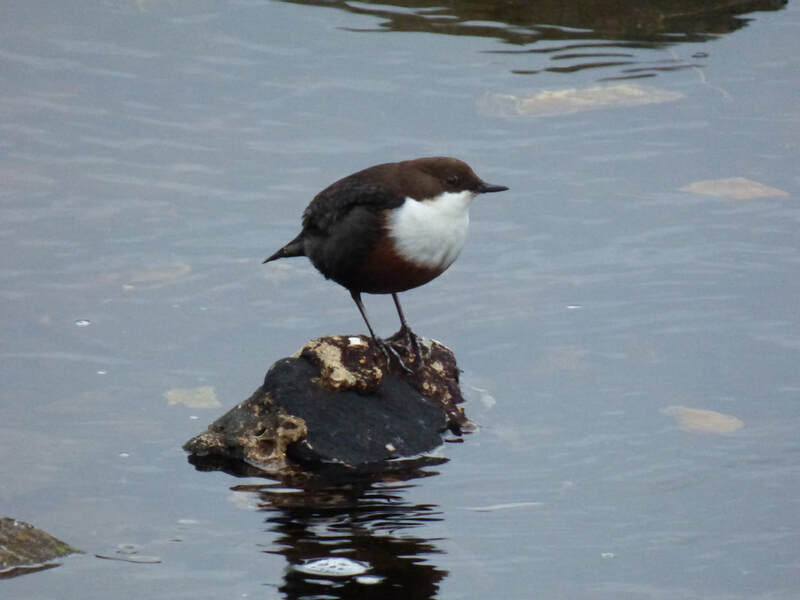 A Black-throated Diver and Slavonian Grebe on Loch Duntelchaig.​ 3 Grey Plovers at Whiteness today along with 56 Whooper swans heading south (Colin Leslie). Wester Ross: Kingfisher flying down River Broom towards estuary at 4pm today (Tessa Rhodes). Juvenile Common Tern at Ullapool (John Tuach). 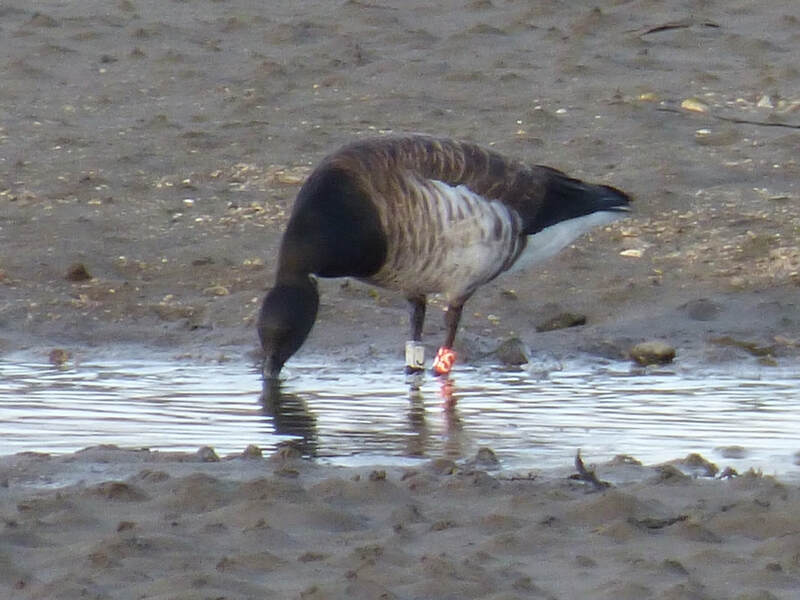 ​The pair of blue morph Snow Geese which were found in Highland in March 2017 by Jonathan Clarke, briefly reappeared in Highland on October 13th. 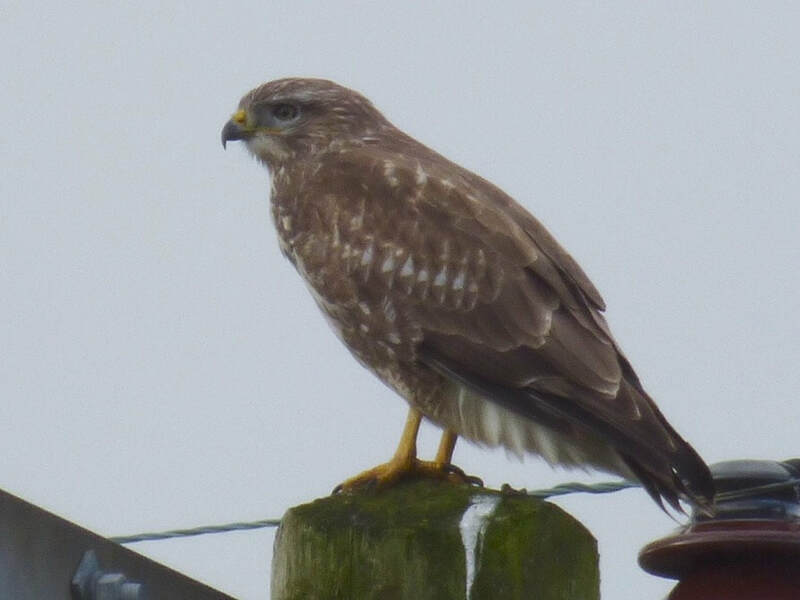 They then were seen in Moray, followed by Northeast Scotland and are now today in Upper Forth, where next on the tour?!. 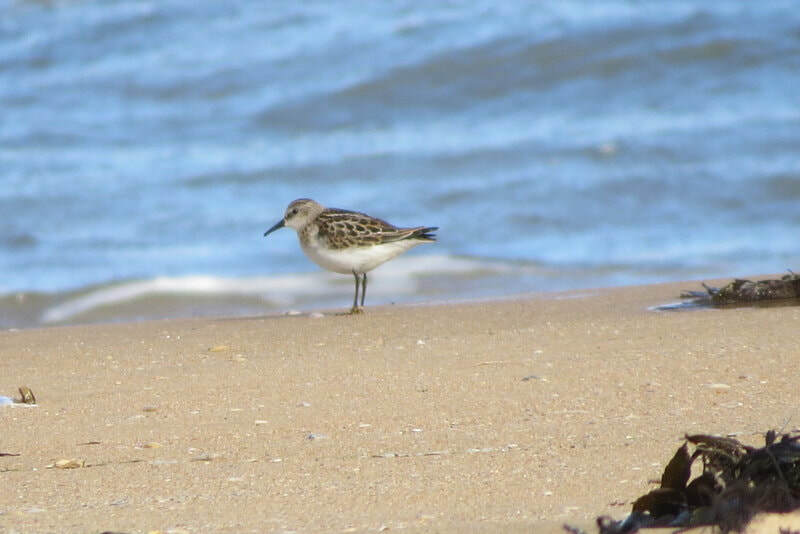 Easter Ross: Juvenile Arctic Tern still present at Tarbat Ness this morning, and an Arctic Skua past (Dave Tanner). Easter Ross: Balearic Shearwater at Tarbat Ness this morning (Dave Tanner). Easter Ross: 2 Arctic Tern at Tarbat Ness and 29 Common Scoter (Dave Tanner). Badenoch and Strathspey: Kingfisher at Nethybridge 10.30am today, at footbridge over Nethy NJ012202. 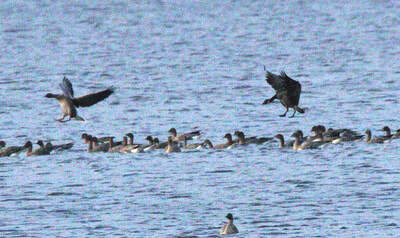 Easter Ross: Drake American Wigeon at Udale Bay again today at 4pm. Juvenile Arctic Tern still off east side of Tarbat Ness. 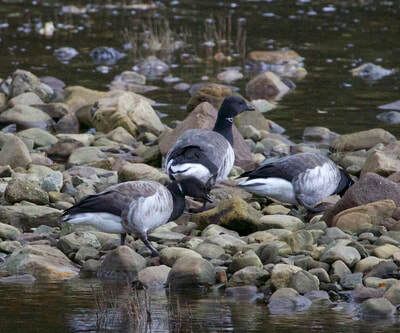 Skye and Lochalsh: 2 Pale-bellied Brent Geese at Dunan. 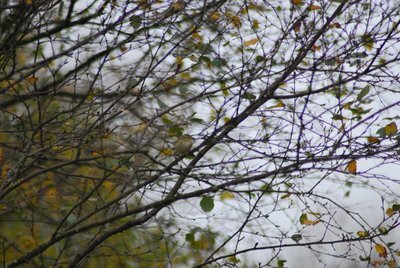 Inverness-shire: 37 Waxwings flew south over Ardersier in two flocks (Marcus Conway). 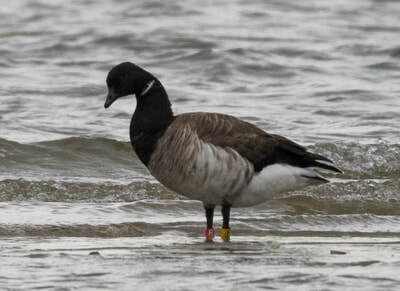 Easter Ross: 20 Pale-bellied Brent Geese in Nigg Bay (D Thorogood). 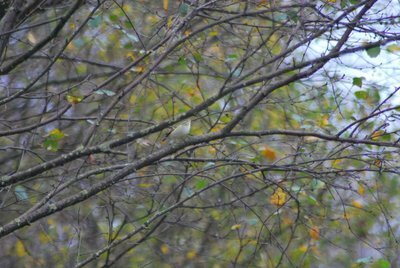 ​Lochaber: Yellow-browed Warbler in trees at mid Kilmory tree plot, 2km from yesterday's Yellow-browed Warbler sighting (Sean Morris). 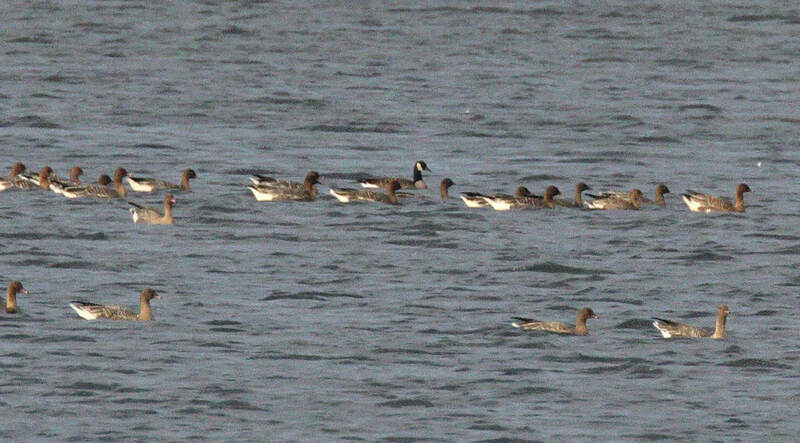 Easter Ross: Drake American Wigeon again at Udale Bay today (Susan Seright). 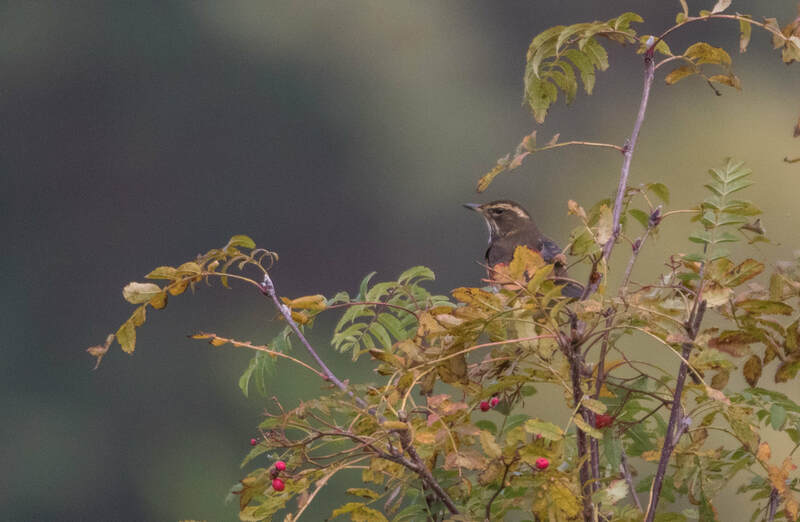 Yellow-browed Warbler in Kilmory, Rum (Sean Morris). 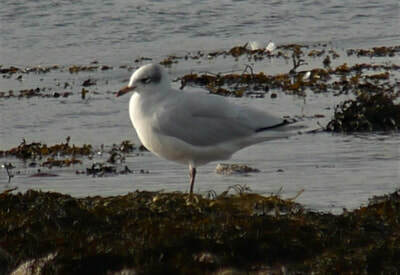 Sutherland: Second-winter Ring-billed Gull at the Stoer (David Haines). 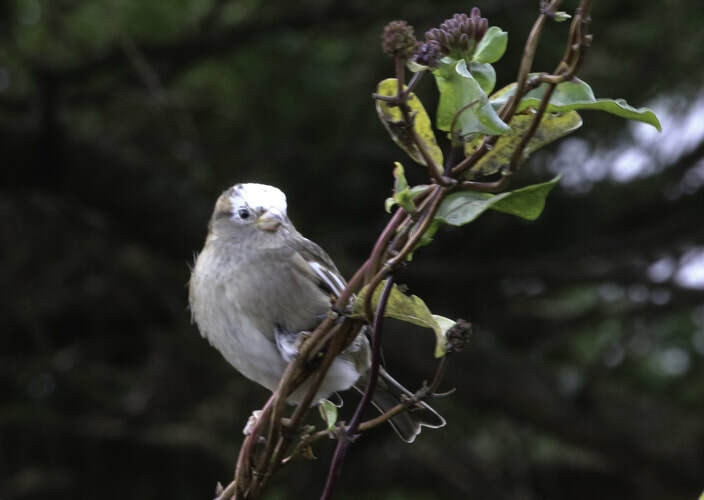 Hawfinch in a garden in Melvich (Graham Crittenden). Easter Ross: Little Auk past Tarbat Ness this morning (Dave Tanner). Lochaber: Yellow-browed Warbler in trees at north Kilmory tree plot (Sean Morris). 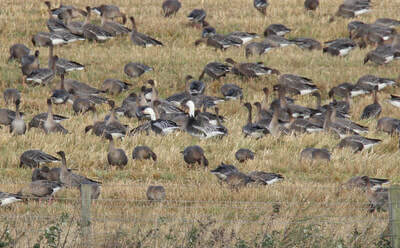 Inverness-shire: At Lentran today, 35 Barnacle Geese and 30 Black-tailed Godwits (Lynden Schofield). Easter Ross: Little Tern southeast past the point at Tarbat Ness at 8am (Dave Tanner). 2 hour seawatch in the afternoon also at Tarbat Ness produced: 3 Pomarine Skuas, 3 Arctic Skuas and an Arctic Tern. 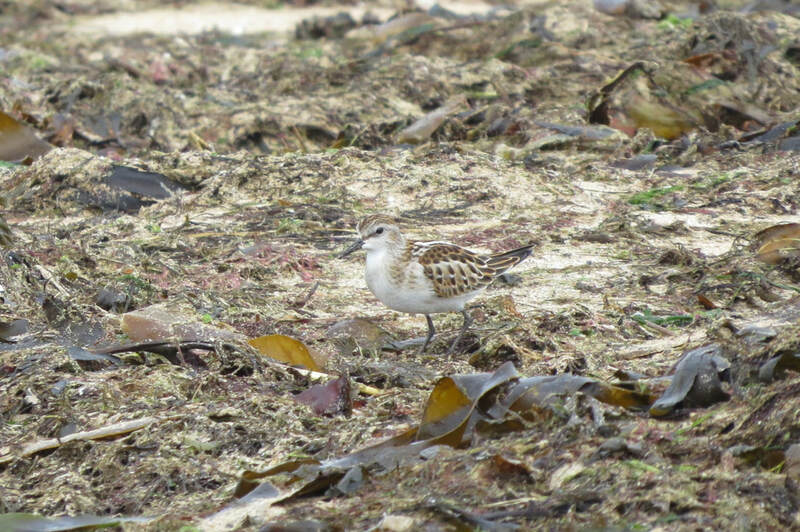 2 Purple Sandpipers were on the rocks, a Jack Snipe near the willows, 2 Bramblings in the plantation and a Blackcap in Brucefield plantation. 320 Whooper Swans were near Brucefield Farm. 8 Waxwings at Tore (Tom Wells). Sutherland; Hawfinch in a garden in Melvich (Graham Crittenden). Easter Ross: Male American Wigeon back at Udale Bay this afternoon on the high tide with approx. 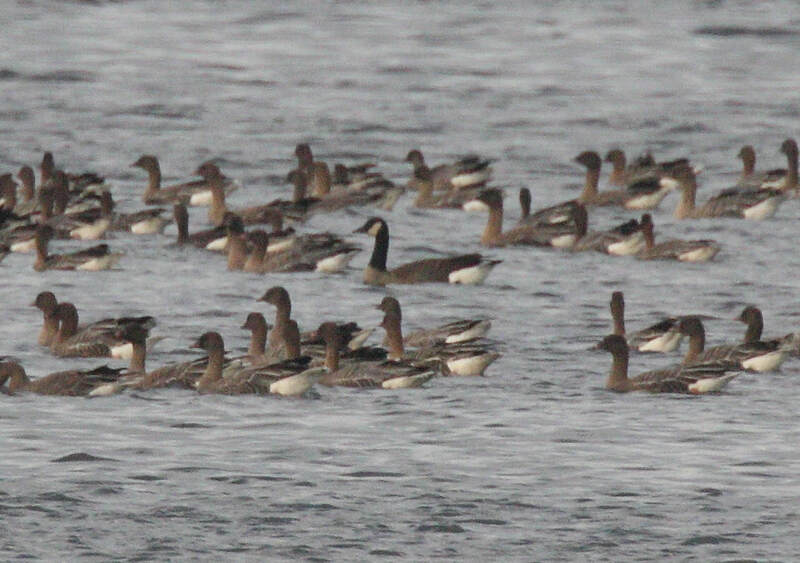 4000+ Wigeon. 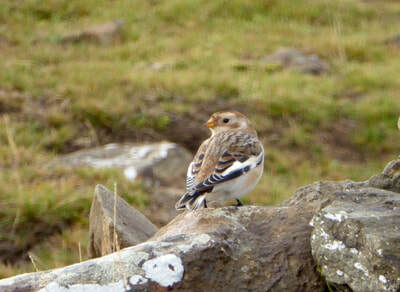 5 Brambling at renovated church heading towards Newhall point, Udale Bay at 1pm (Dave Slater). Hawfinch near Millcraig, Alness at NH647712 (Jimmy Fraser). Sutherland: 3 Brambling at the south end of Golspie golf course. 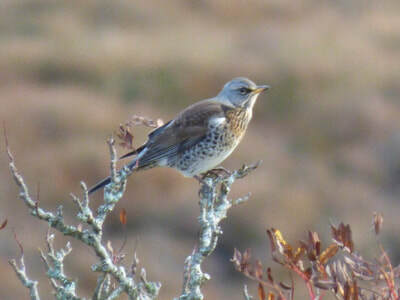 120 Fieldfare and 80 Redwing at Brora. 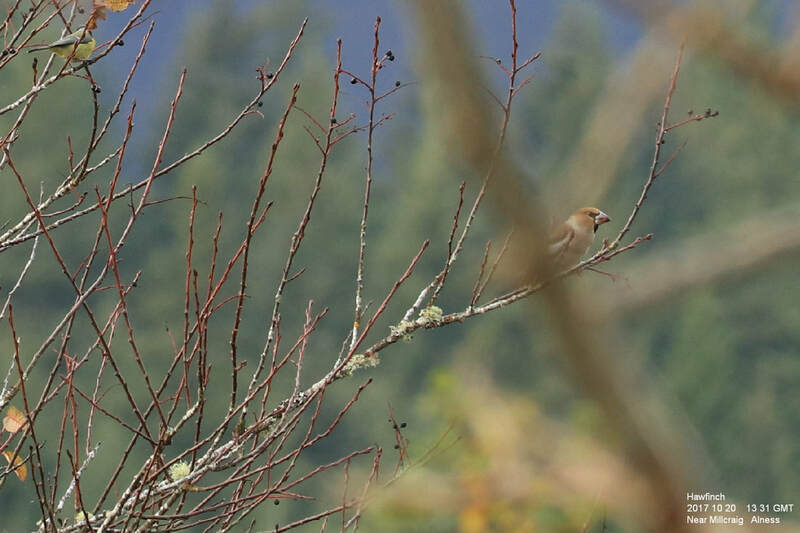 Hawfinch at Rhigolter, Strath Dionard (Hugh Insley). Lochaber: 3 Bramblings at Kinloch and a single at Kilmory (Sean Morris). Sutherland: Redwings heading south over Dornoch all day probably several thousands (Dean MacAskill). Inverness-shire: Single Jack Snipe on the marsh behind the seawall to South Kessock this afternoon. Inverness-shire: 6 Whoopers on Loch Beinn a Mheadhoin, Glen Affric today, also 13 at Loch Flemington. 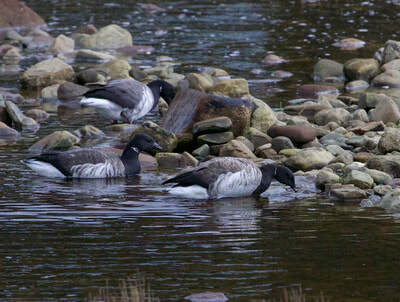 1 Barnacle Goose with Pinkfeet at the Lovat Bridge, Beauly (Colin Leslie). Wester Ross: Mediterranean Gull at Altbea Hotel today (Dave Slater). Second-winter Ring-billed Gull present on the saltmarsh at Dundonnel again this afternoon 1630 to 1700 at least. Sitting a wee distance away from the main gull group. Seems to come in with the rising tide (Sean Jaques). 20 Redwing over Lochbroom today (Tessa Rhodes). 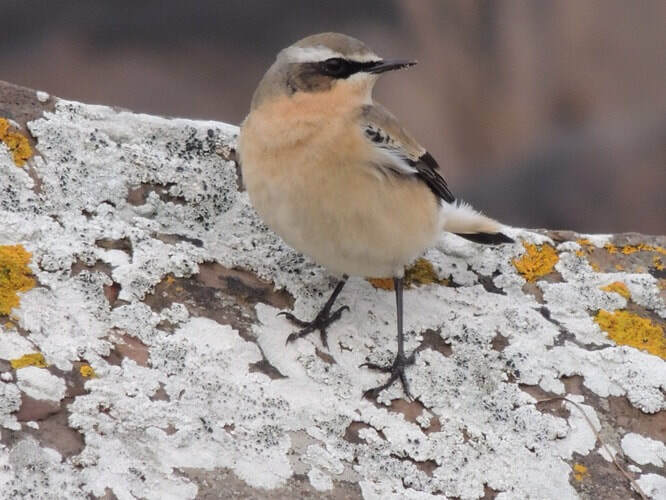 Easter Ross: Early morning past Tarbat Ness: Whooper Swan - 29 southeast, Great Northern Diver - southwest, Velvet Scoter - 3 males southwest, Great & Arctic Skua present off the point. Juvenile Iceland Gull southeast past the point into the Inner Moray Firth at 8am (Dave Tanner). 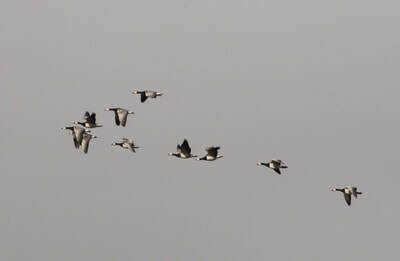 Around Wester Rarichie at 4 pm today: 6 Barnacle Geese, c600 Pink-foots, 110 Greylags, 268 Whooper Swans (Simon Levene). Skye and Lochalsh: Adult Sabine's Gull in Broadford Bay today with Kittiwake flock (Bob McMillan). 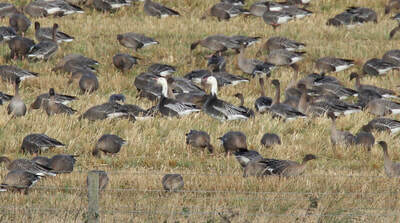 Easter Ross: 3 Barnacle Geese, 2 Pomarine Skua (1 adult 1 prob juv) past Tarbat Ness this morning (Dave Tanner). 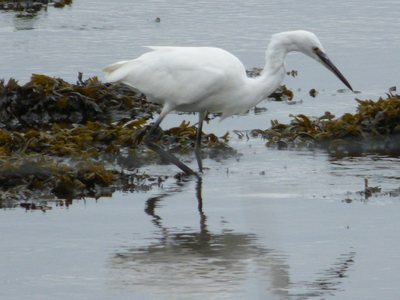 Little Egret still at Udale Bay (David Carter). 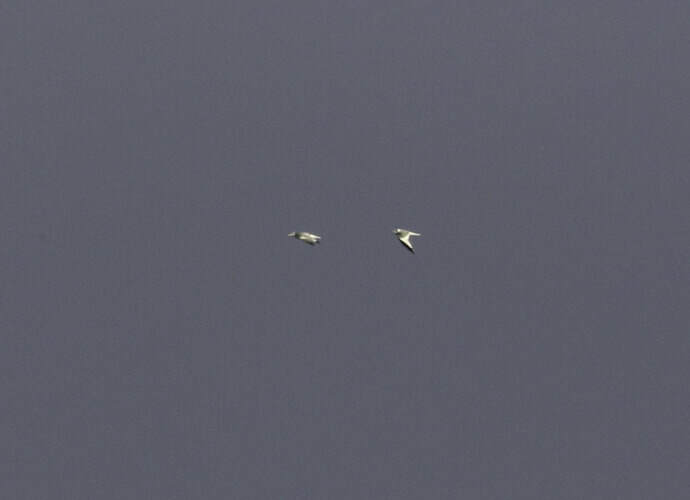 Wester Ross: 20 Whopper Swan flew Southwest over Corrieshalloch Gorge late morning. At Gruinard Bay this afternoon; 5 Pale-bellied Brent Geese and 1 juvenile Arctic Tern. No sign of the Ring-billed Gull at Dundonnel (Sean Jaques). Lochaber: Glossy Ibis still on Rum today (Sean Morris). 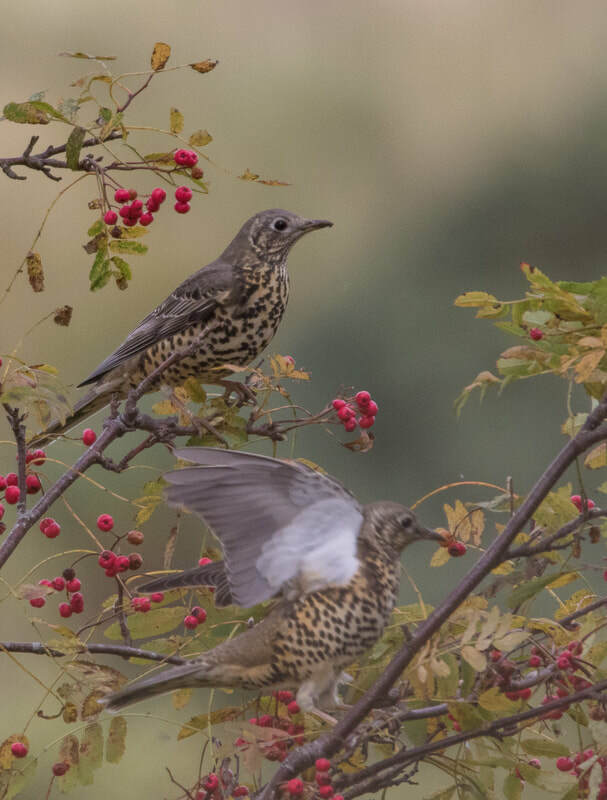 General influx of Redwings into Inverness-shire and Badenoch and Strathspey, small numbers on west coast. Sabine's Gull in Broadford Bay (Bob McMillan). Sabine's Gull in Broadford Bay (Bob McMillan)..
Wester Ross: 2nd winter Ring-billed Gull with mixed gull flock at Dundonnel at the head of Little Loch Broom (Sean Jaques). 5 Pale-bellied Brent Geese at the Ullapool river mouth today (Andy Williams). 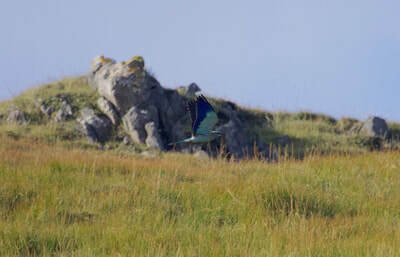 Lochaber: Glossy Ibis still on Rum (Trudi Clarke). Sutherland: Jay today at Balchladich​, only the second Assynt record! (David and Avril Haines). Off Embo this afternoon, between 15:00pm and 16:00pm; 1200 Kittiwake's all south , 11 Bonxie , 7 Arctic Skua , 4 Pomarine Skuas and 1 juvenile Long-tailed Skua, 4 Manx Shearwaters and 5 Barnacle Geese , all heading south. 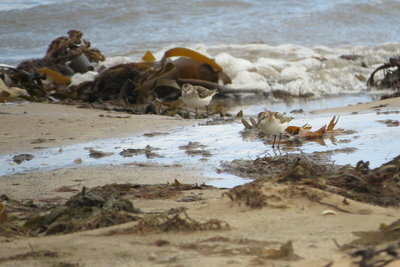 5 Sooty Shearwaters and 23 Long-tailed Duck going north (Dean MacAskill). Easter Ross: At Chanonry Point today between 1400pm and 1600pm: 1 Grey Plover flying over; 1 Purple Sandpiper on pier; 1 Bonxie; 830 Kittiwake; 52 Long-tailed Duck and 6 juvenile Gannet (Mary and David Galloway). 10,000 Pink-footed Geese at Dale Bay today (Mary Galloway). 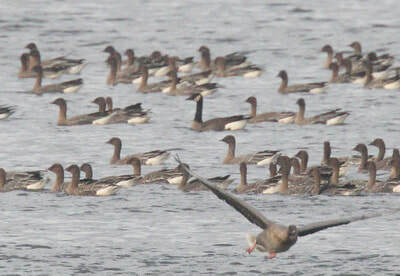 12 Greenland White-fronted Geese at Munlochy Bay (David Slater). Great Crested Grebe still at the east end of Loch Eye (Bob Swann). 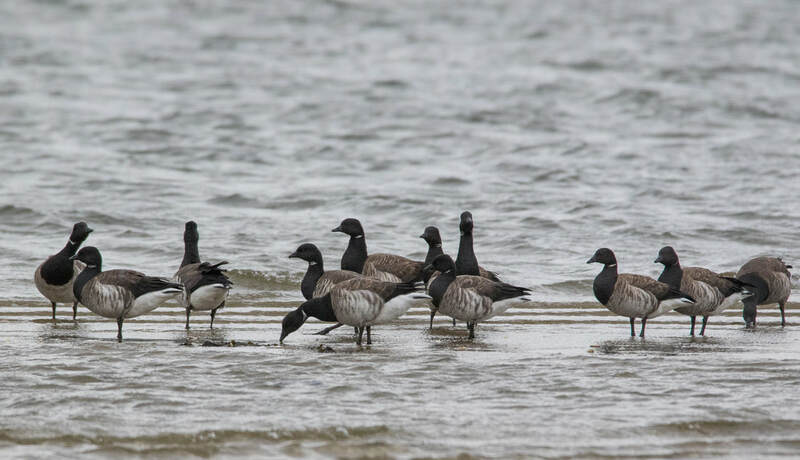 Pale-bellied Brent Geese at Ullapool (Andy Williams). 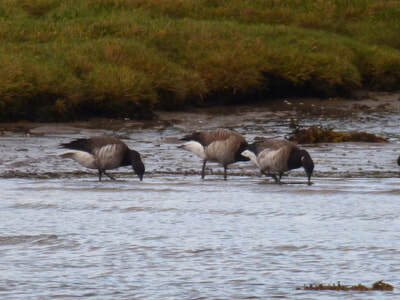 Pale-bellied Brent Geese at Ullapool (Andy Williams)..
Inverness-shire: Single Small race Canada Goose with the Pink-footed Goose flock at Tomhommie, Gollanfield today, but no sign of the 2 adult blue morph Snow Geese (Tom Wells). Sutherland: Immature Glaucous Gull at Kyle of Tongue at 1225pm (Scott Wotherspoon). 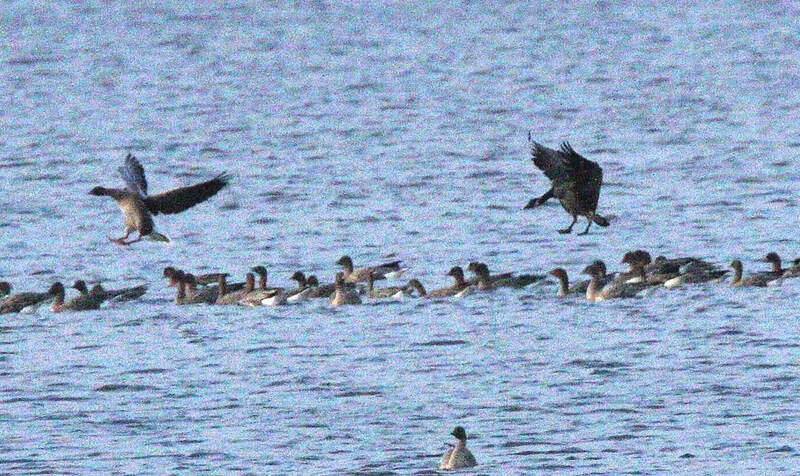 Easter Ross: Adult Pomarine Skua, 3 Pale-bellied Brent Geese and 3 Long-tailed Duck past Tarbat Ness this morning (Dave Tanner). Lochaber: Glossy Ibis still on Rum at Kinloch this morning and also 20 Pale-bellied Brent Geese, 5 Whooper Swan and 40 Barnacle Geese over Kilmory (Sean Morris). 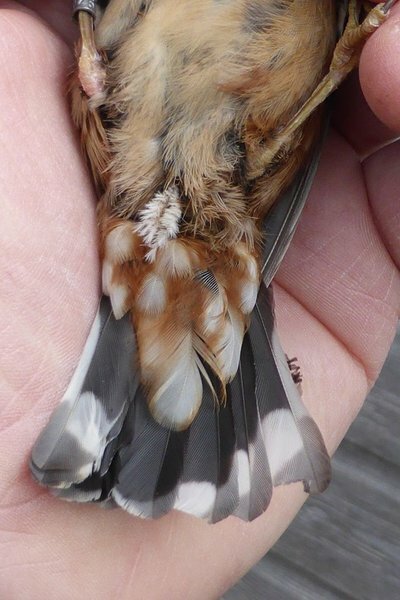 Wester Ross: Single Redwing at Loch Broom (Tessa Rhodes). 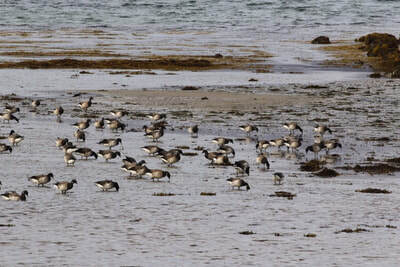 Skye and Lochalsh: Still 25 Pale-bellied Brent Geese in Broadford Bay first thing and 84 later which flew south; another 76, then 90 arrived mid afternoon; also 10 at Ardnish (Martin Benson, Bob McMillan) - probably at least 250 birds - it has obviously been a poor breeding season as most of these birds are adults. 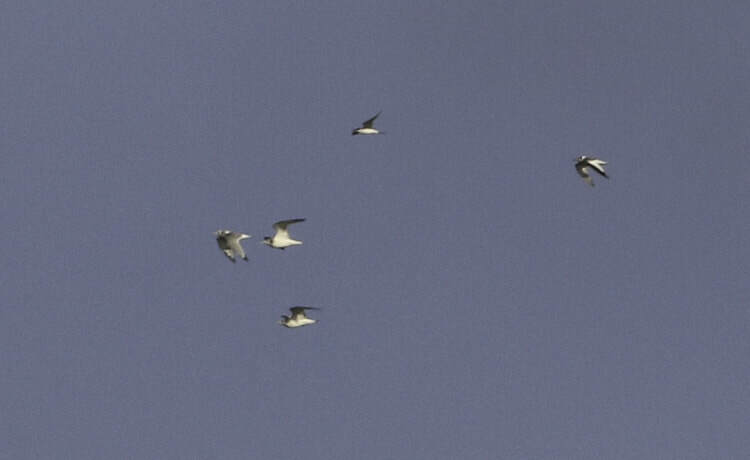 10 Barnacle Geese in Broadford Bay (Martin Benson) and 100 heading south-west over Portree; also 24 north at Gedintailor. 9 Whooper Swans at Loch Cillchroisd; big movement south over Portree when the weather cleared in afternoon - 60 in three groups heading south; 15 over Kyleakin. Two Pomarine Skuas also present in Broadford Bay (Martin Benson). 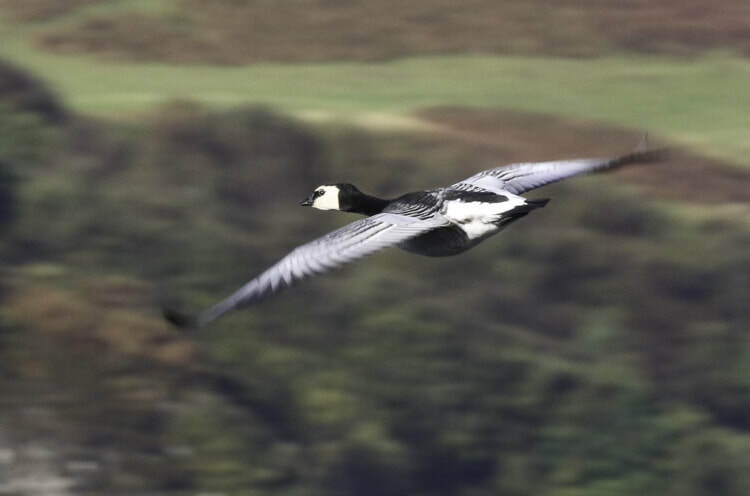 Continued passage of Barnacle Geese, Pale-bellied Brent Geese and Whooper Swans down the West coast past Skye and Rum. 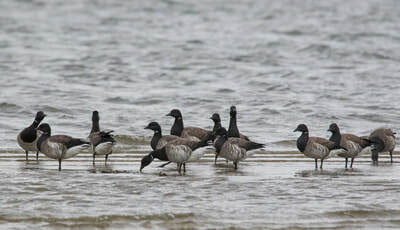 Pale-bellied Brent Geese in Broadford Bay (Bob McMillan). Small race Canada Goose at Tomhommie (Tom Wells). 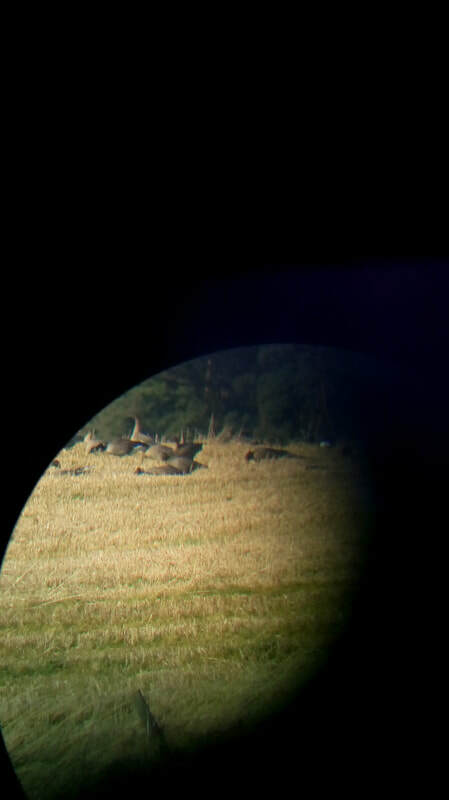 Lochaber: Glossy Ibis at Kinloch, Rum today on the castle field at 1425pm (Trudi Clarke and Sean Morris). 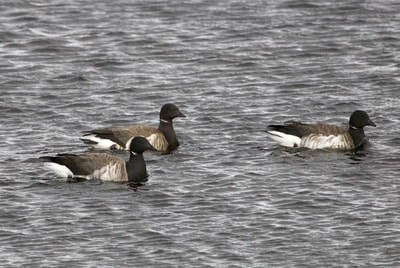 Inverness-shire: 22 Pale-bellied Brent Geese at Whiteness this afternoon also 3 Golden Plover. 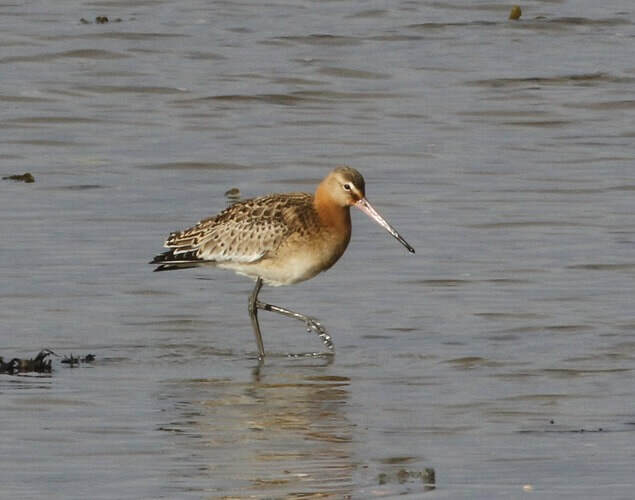 1 Black-tailed Godwit and 1 Slavonian Grebe in Castle Stuart Bay (All Colin Leslie). 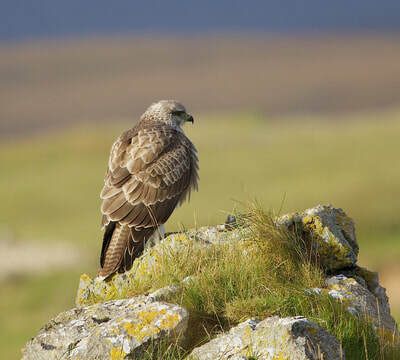 Sutherland: Immature White-tailed Eagle over the mound this afternoon, 5 Greenshank at Loch Fleet (Dean MacAskill). Easter Ross: No sign of Great Crested Grebe at Loch Eye today (Bob McMillan). 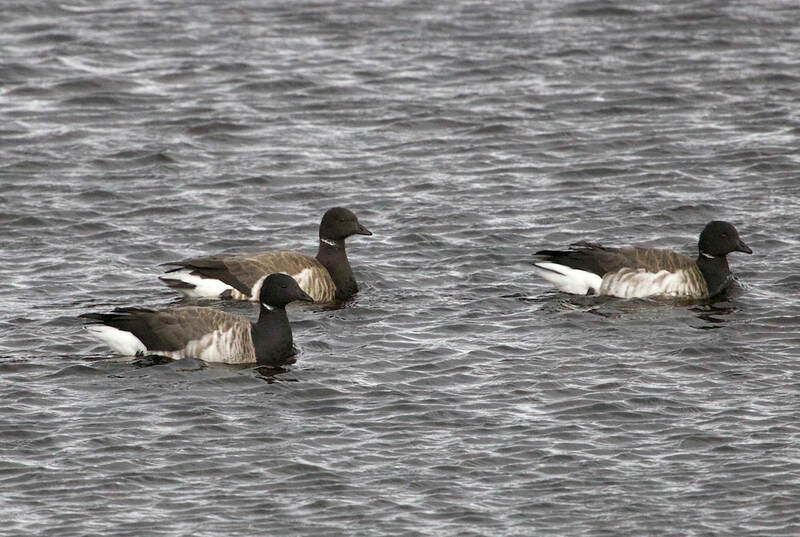 Skye and Lochalsh: Also 260 Pale-bellied Brent Geese and 3 Long-tailed Duck at Broadford Bay (Bob McMillan). 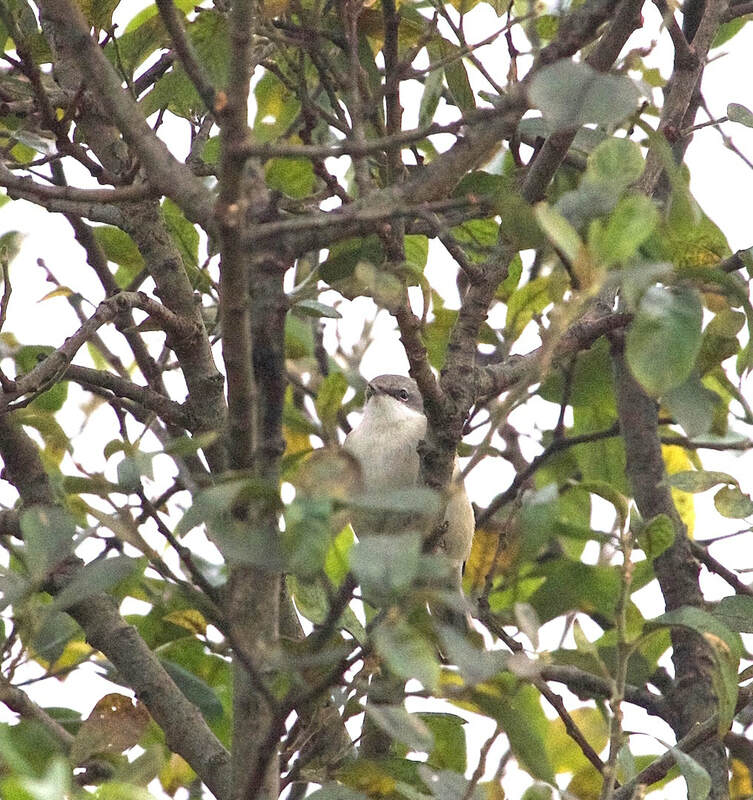 Sutherland: White-billed Diver from Embo pier late this afternoon also a Sandwich Tern and Arctic Tern south, yesterday a single Tree Sparrow on feeders in garden Embo (Dean MacAskill). At Culkein Stoer, Assynt this afternoon. 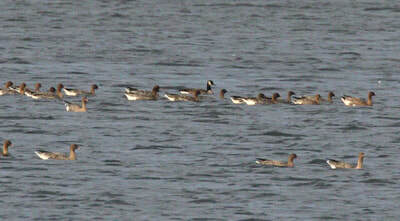 37 Pale-bellied Brent Geese, 21 Barnacle Geese, 8 Golden Plover and around 100 Black-headed Gulls. Also a single adult Little Tern! (Avril and David Haines). Barn Owl at Gruinard Bay, also 10 Great Northern Divers, 3 Black-throated Diver, 4 Red-throated Diver and a Slavonian Grebe (Alan MacAskill). 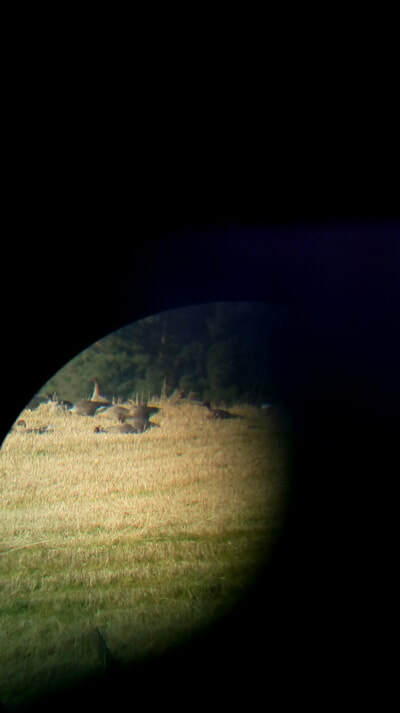 Inverness-shire: Two Snow Geese, one blue, one intermediate morph, at Tomhommie near Gollanfield at NH822538 (Peter Stronach). 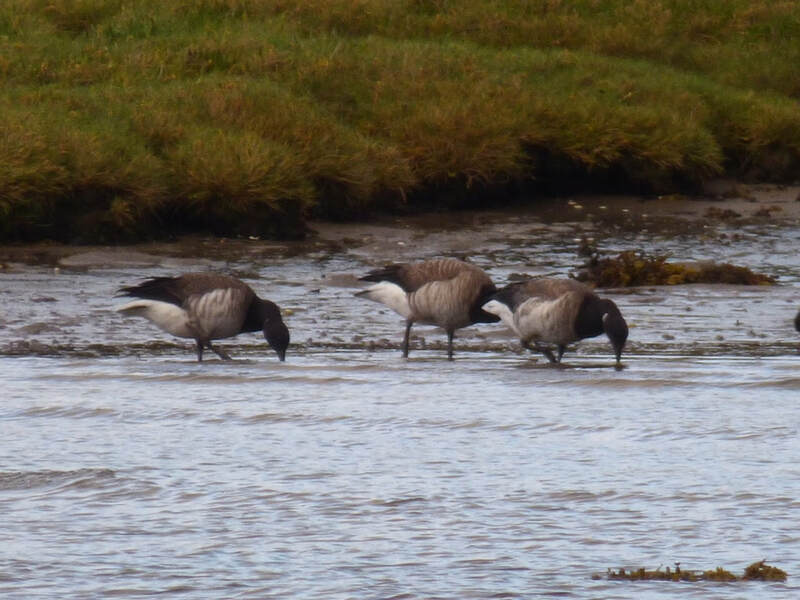 Skye and Lochalsh: 17 Pale-bellied Brent flew in from north and landed briefly on Ardnish, Broadford (Bob McMillan); another 34 through Broadford Bay at midday (Martin Benson); c100 arrived late afternoon (Carol Benson). 8 Greenland White-fronted Geese flew into Broadford Bay in morning from the north and pushed on south (Bob McMillan); another group of 6 south at Ashaig early afternoon; another group of 5 west over Portree mid afternoon and two over Kildonan Point, Eigg (John Chester). Flock of 12 Barnacle Geese flew south through Broadford Bay this morning (Bob McMillan) in afternoon at Portree skeins of 40 and 35 pushing west (NB). ​Lochaber: 20 Greenland White-fronts on River Shiel (Andrew Dacre). ​Continued passage of geese through the west coastal areas on continued westerly winds. The two Snow Geese at Tomhommie were the pair seen in the same area in 19th March 2017 link here, the gander is an intermediate morph and the goose a blue morph, both are full adults. 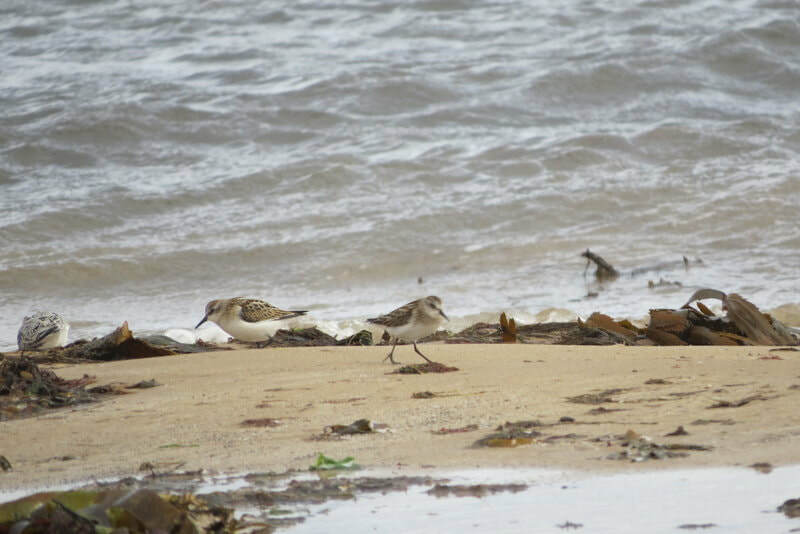 They were seen firstly this autumn on the 12th October at Findhorn Bay in Moray, see link and photos here. Snow Geese at Tomhommie (Peter Stronach). 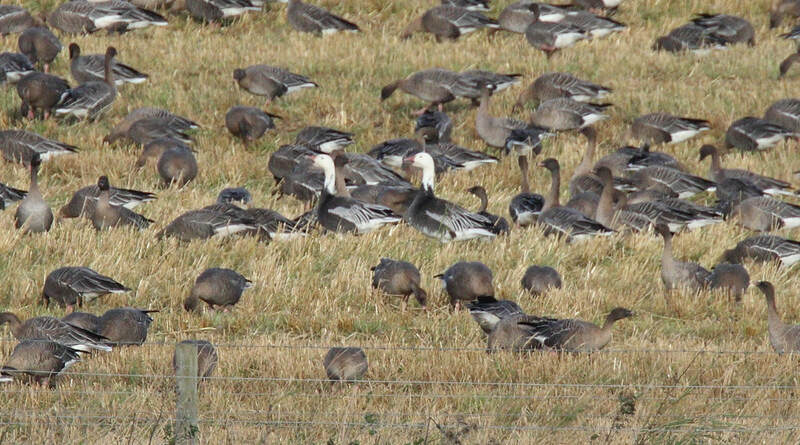 Snow Geese at Tomhommie (Peter Stronach)..
Easter Ross: Todd's Canada Goose, 2 Greenland White-fronted Goose, Barnacle Goose, leucistic Pink-footed Goose and a Pale-bellied Brent Goose with pink-feet at the roost at Udale Bay this evening (Peter Stronach). Great Crested Grebe on Loch Eye this morning, also 860 Whooper Swan moving between the loch and fields around Balinroich and Clay of Allan. Also 400 Greylags, probably recently arrived on the Loch (Bob Swann). 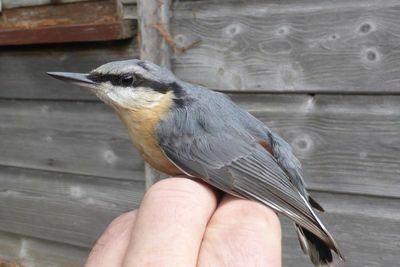 Inverness-shire: Nuthatch still present in garden at Fort Augustus, since Saturday. One Grey Plover at Whiteness today, also 3 Chiffchaff's on track (Colin Leslie). Skye and Lochalsh: 43 Barnacle west over Loch Greshornish, Skye this afternoon (Tom Wells), earlier in early morning three small flocks totalling 55 moved southwest through Broadford Bay later 30 landed on Ardnish, Broadford (Bob McMillan). 4 Common Scoter flew west into Broadford Bay, also a Whimbrel present. 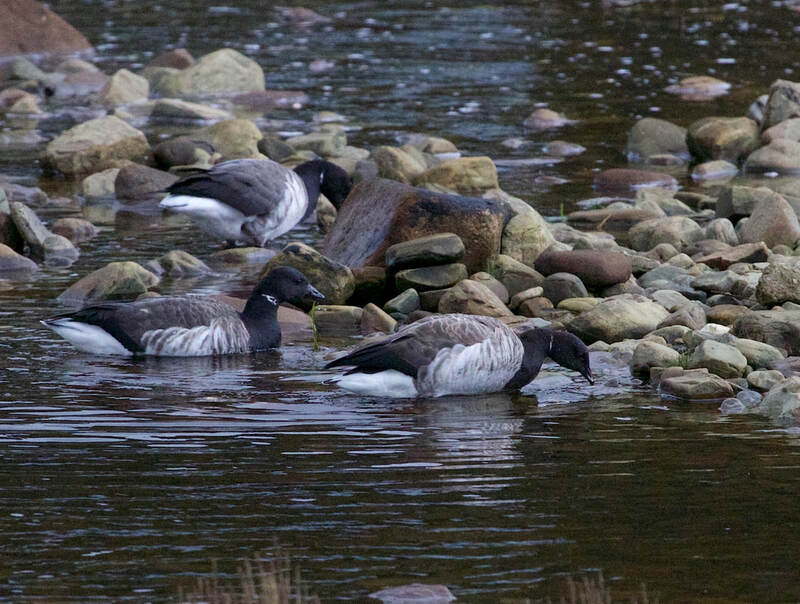 Early morning movement of 16 Pale-bellied Brent Geese and 24 southwest through Broadford Bay; 7 at the Broadford River (Martin Benson). Lochaber: Kingfisher on the Morar river (Stephen MacDonald). 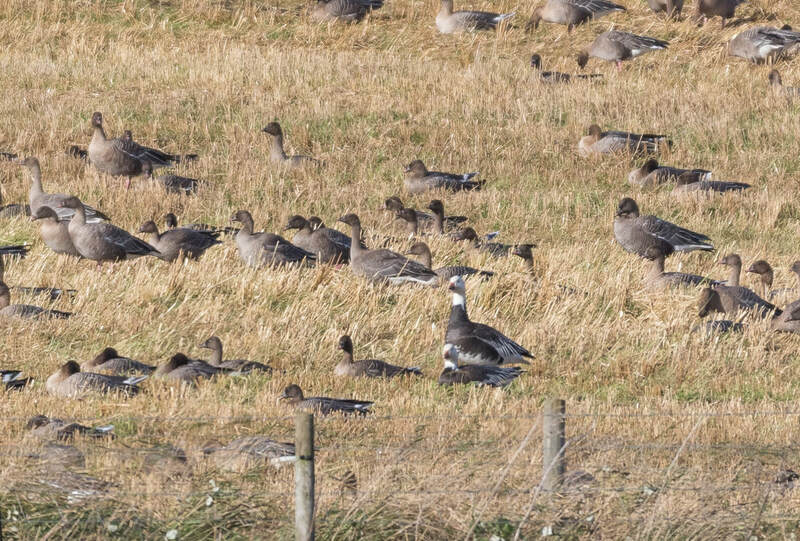 55 Barnacle Geese at Kilmory (Sean Morris). 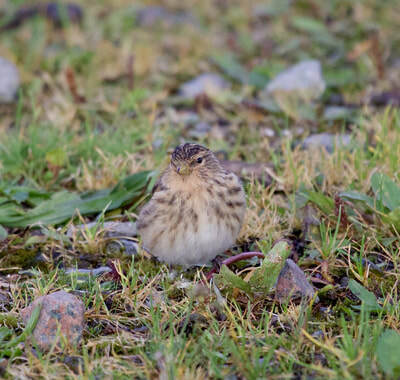 Wester Ross: Jack Snipe at Achiltibuie (Hugh Insley). Badenoch and Strathspey: 2 Ruff at Dell of Killiehuntly (Dave Pierce). 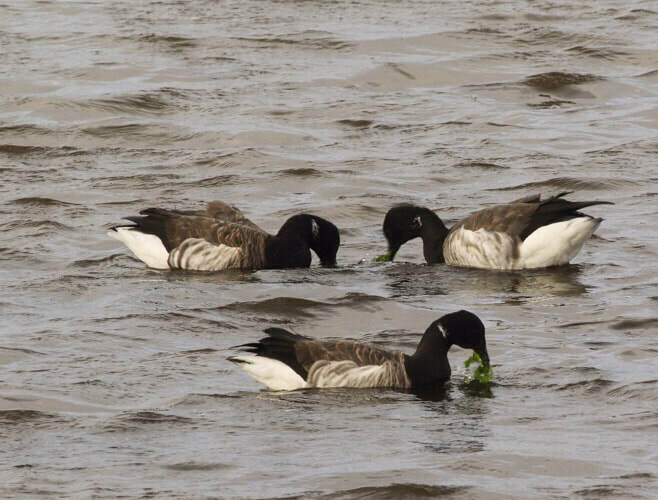 Strong westerlies winds pushing Barnacle goose and Pale-bellied Brent Goose passage onto west coast and Skye. 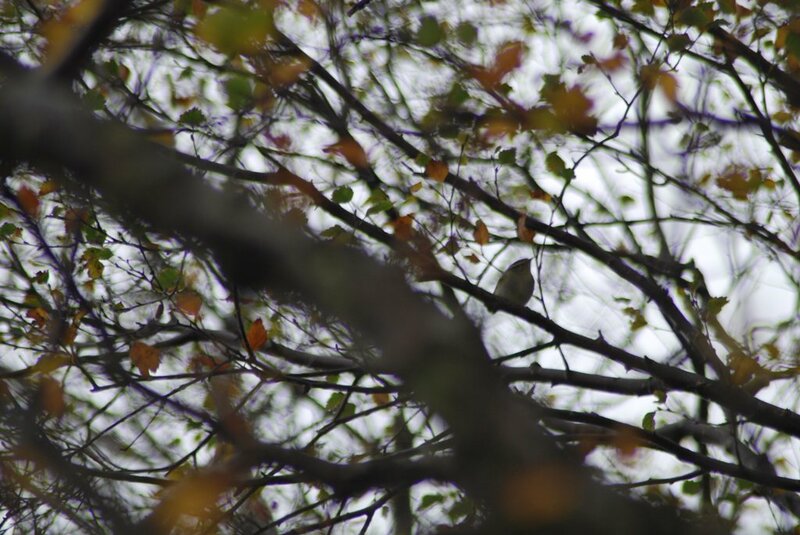 ​Lochaber: Yellow-browed Warbler in plantation at Kilmory, Rum (Sean Morris). 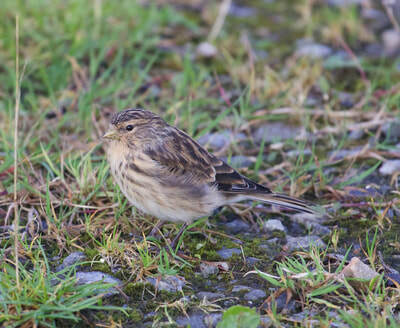 Wester Ross: Flock of 23 Twite at Ullapool campsite (Andy Williams). Lochaber: Kingfisher back on the Morar river, upstream of the dam at 1030am this morning (Stephen MacDonald). 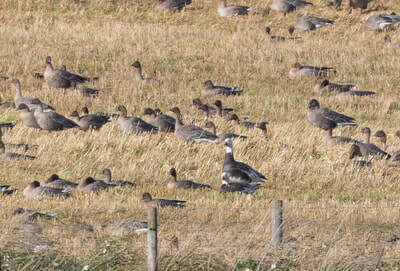 24 Barnacle Geese at Kilmory, Rum (Sean Morris). 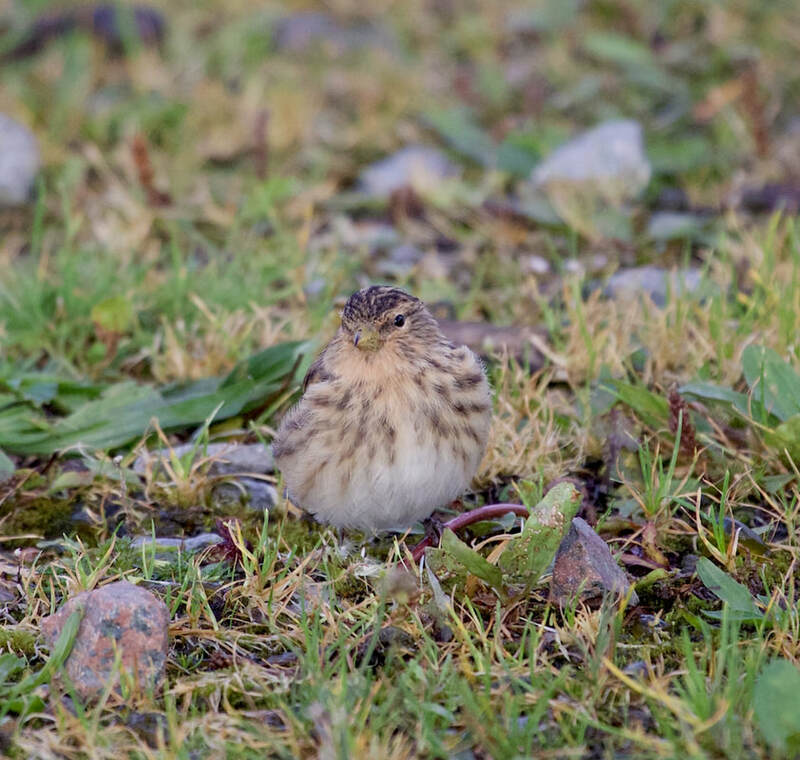 Twite in Ullapool (Andy Williams). Easter Ross: At Udale Bay today, 2 hours before high tide, Little Egret showing well plus a Kingfisher on a post in the marsh and nearby a Pale-bellied Brent and 3 Barnacle Geese (Bob Wilson and John Carruthers). 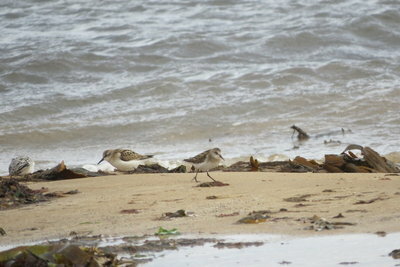 Sutherland: Still 6 Little Stint at Dornoch Point and a Ruff (Dean MacAskill). 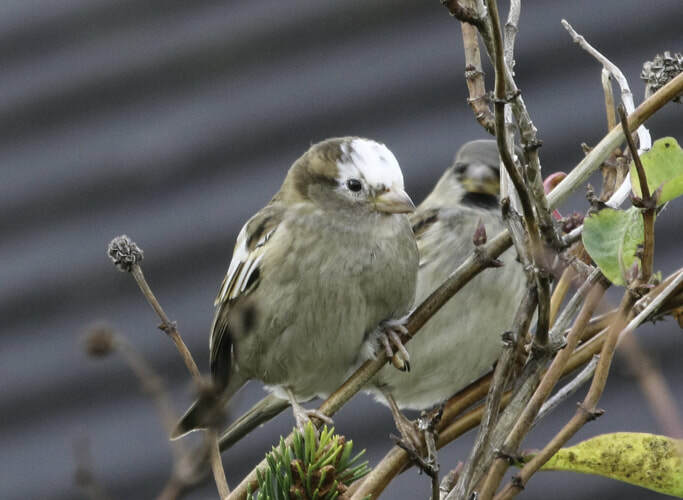 White-crowned House Sparrow in Broadford (Bob McMillan). Wester Ross: Lesser Whitethroat in a garden at Morefield, Ullapool (Andy Williams). 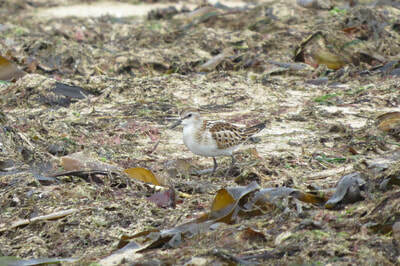 Easter Ross: Little Egret still at Udale Bay and 2 Purple Sandpipers at Tarbat Ness (Lynda Graham). Inverness-shire: Nuthatch caught and ringed at a garden in Fort Augustus (John Owen). 46 Mistle Thrush with 14 Redwing in 3 groups over Fort George this morning, also a Chiffchaff and several Goldcrests (Colin Leslie). 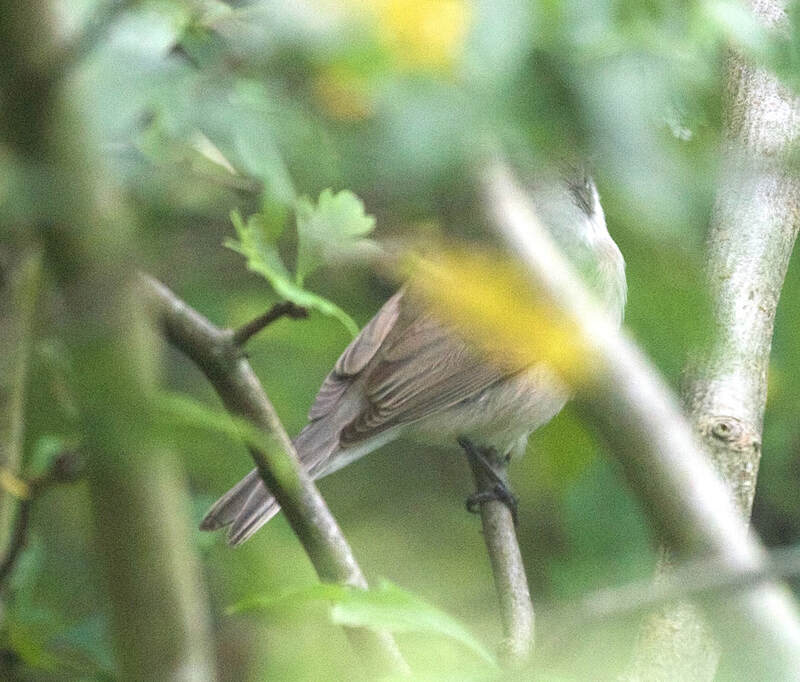 Lesser Whitethroat in Ullapool (Andy Williams). 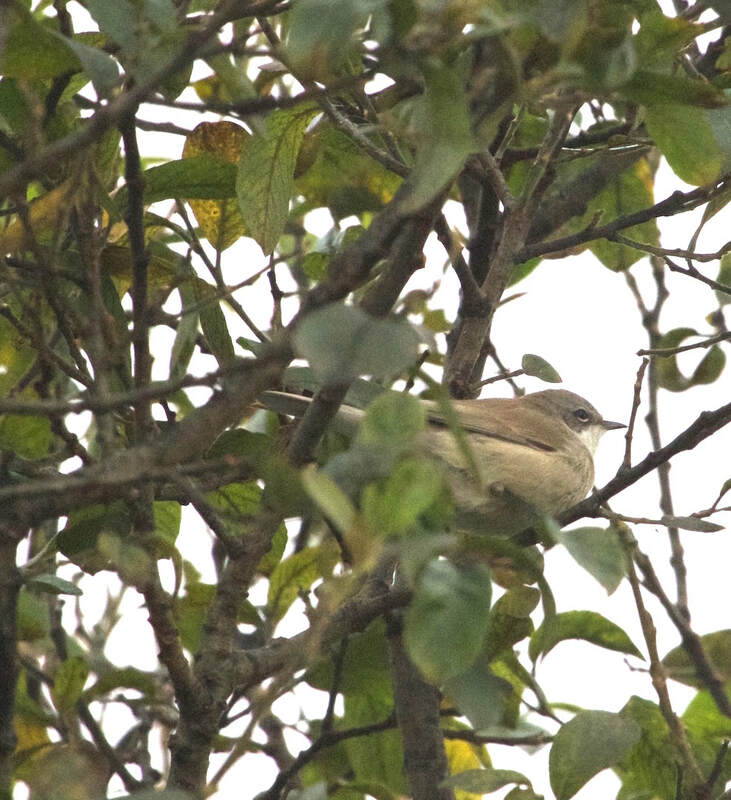 Lesser Whitethroat in Ullapool (Andy Williams)..
Nuthatch at Fort Augustus (John Owen). Easter Ross: Drake American Wigeon at east end of Loch Eye at 1330pm, with 234 Whooper Swans (Bob Swann). Sutherland: 6 Little Stints still at Dornoch on the beach today (Dean MacAskill). Easter Ross: Little Egret at Udale Bay today at 1045am (Lynda Graham). 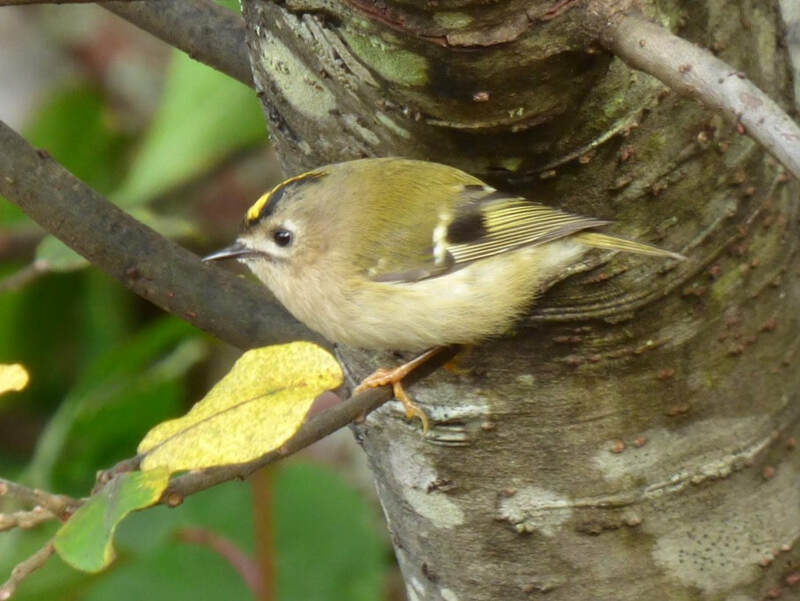 Sutherland: Two Yellow-browed Warblers still at Kinlochbervie in garden at NC219565 (Andy Williams, Dean MacAskill et al). 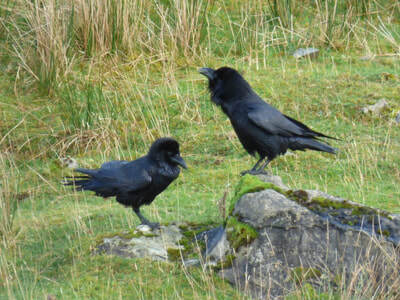 No sign of Roller at Durness today. 5 Whooper Swan on Loch Croispol. Badenoch and Strathspey: 5 Whooper Swans on Lochindorb and 5 on Loch Insh. Late news of a Yellow-browed Warbler at Polbain, Achilitbuie on the 29th September (Mike Bell). 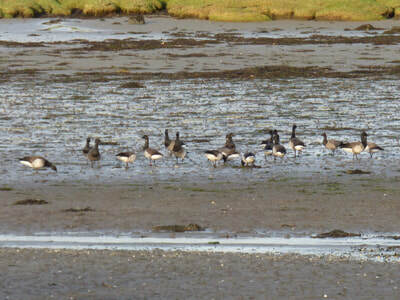 Easter Ross: 7 Little Stints at Dornoch Point today at high tide and a Barnacle Goose (Dean MacAskill). Black-throated Diver past Tarbat Ness southwest into Dornoch Firth (Dave Tanner). Skye and Lochalsh: Single Barnacle Goose at The Aird, Gedintailor today (Bob McMillan). 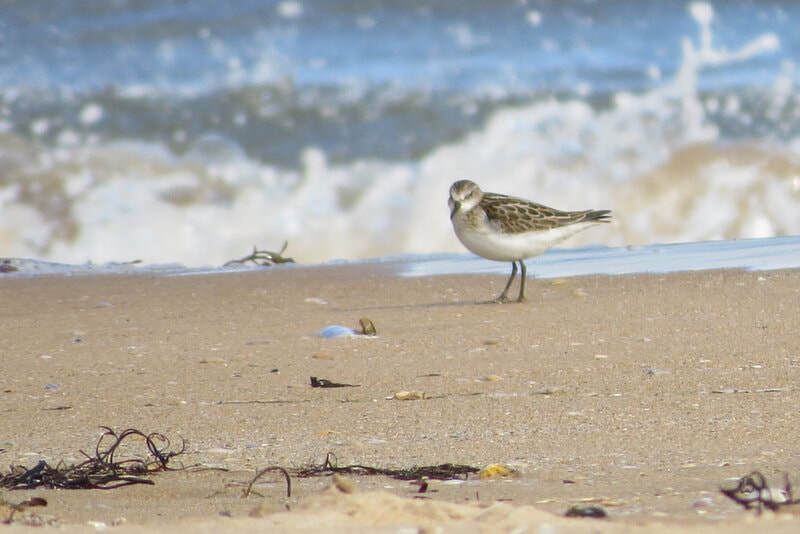 Little Stints at Dornoch (Dean MacAskill). Sutherland: Probable White-billed Diver off Embo pier today but lost it in choppy conditions (Dean MacAskill). 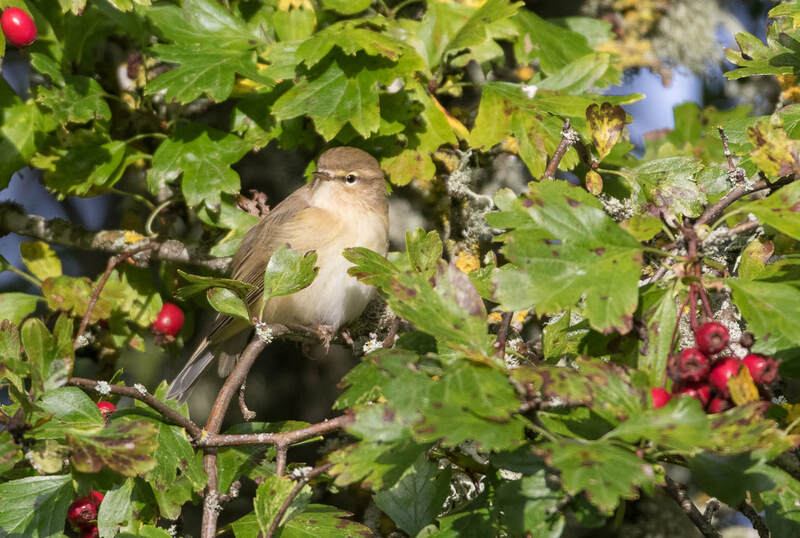 Inverness-shire: Two Chiffchaffs at Castle Stuart and a Grey Wagtail on the church roof there this morning (Colin Leslie). ​Skye and Localsh: 21 Whooper Swan over and a Willow Warbler (Phil Knott). 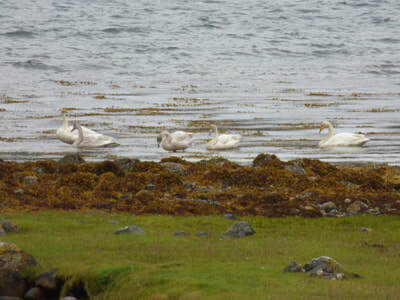 25 Whooper Swan south of Sound of Raasay in two skeins, also 8 Barnacle Geese north (Bob McMillan). 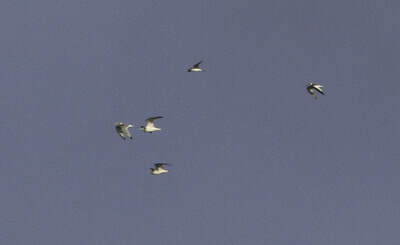 7 Barnacle Geese over Portree. 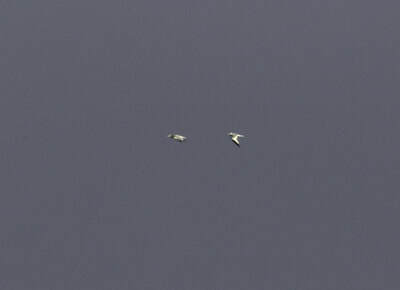 Badenoch and Strathspey: 4 Whooper Swan over Nethy Bridge (Keith Duncan). 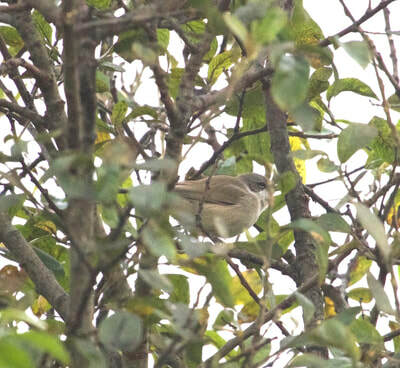 Easter Ross: 2 adult Chiffchaffs and 1 male Blackcap at SNH office on Dingwall Business Park this afternoon (Simon Cohen). 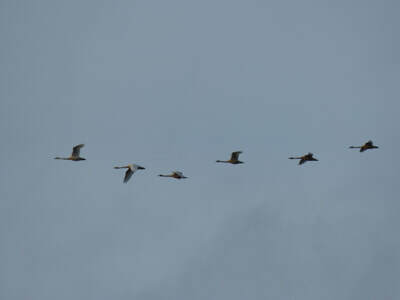 Whooper Swans arriving today and last few days on a strong northwesterly wind from Iceland. 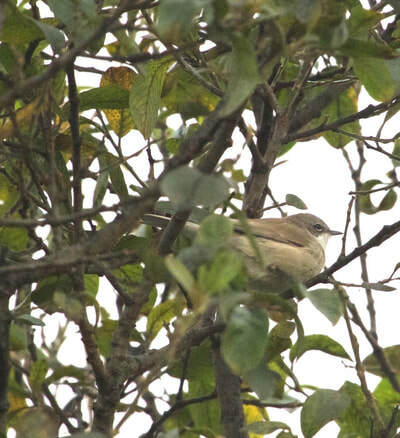 Sutherland: Roller still present 600m southwest of Balnakeil village on rock faces above marshy area with upright posts, although mobile at 1130am, also Whooper Swan (Andy Williams). 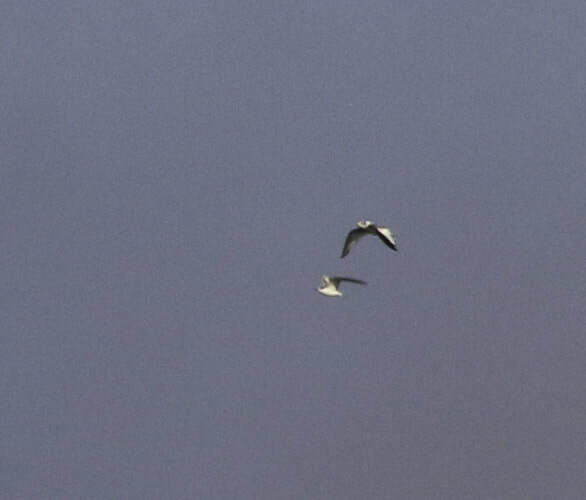 Long-tailed Skua and a Pomarine Skua past Sheigra this morning at 0830am​ (Birdguides). Skye and Lochalsh: 17 Pale-bellied Brent Geese in Broadford Bay and 5 Whooper Swan at Scalpay Narrows (Bob McMillan). 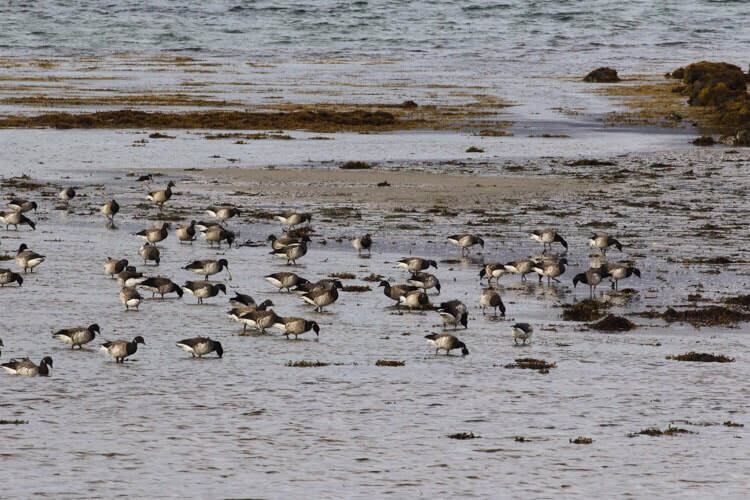 ​Wester Ross: 4 Pale-bellied Brent Geese north of Applecross on beach here. 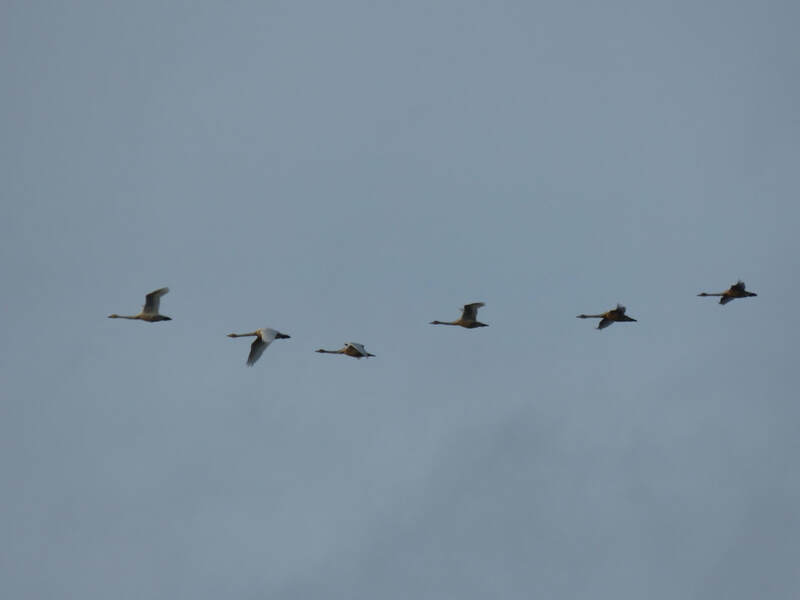 Inverness-shire: 8 Whoopers flying over Ardersier lunchtime​ (Colin Leslie). Skye and Lochalsh: Four juvenile Sabine's Gulls in Broadford Bay, also 16 Pomarine Skua, 10 Bonxie, 6 Arctic Skua, Manx Shearwater and a Tern sp.. 5 Pomarine Skua, 13 Bonxie, 3 Arctic Skua in the Sound of Raasay. 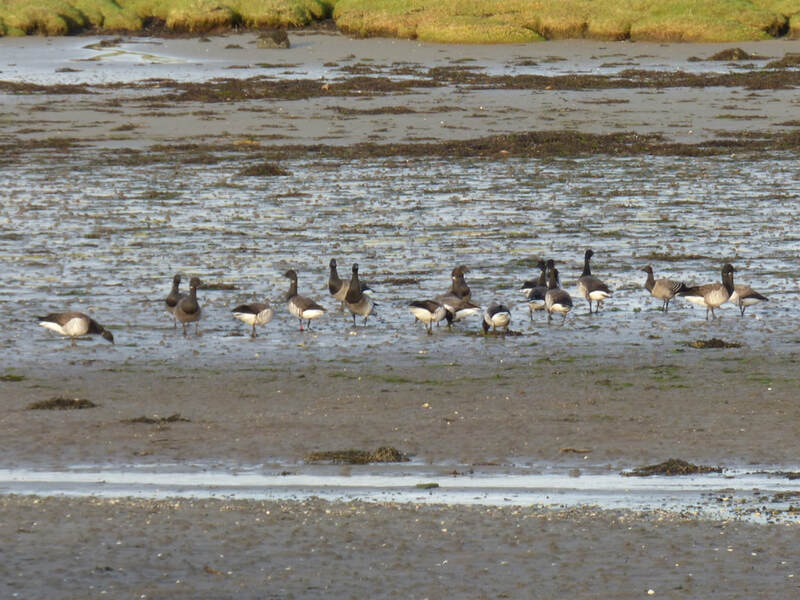 30 Pale-bellied Brent Geese in Broadford Bay too. (All Bob McMillan and Martin Benson). 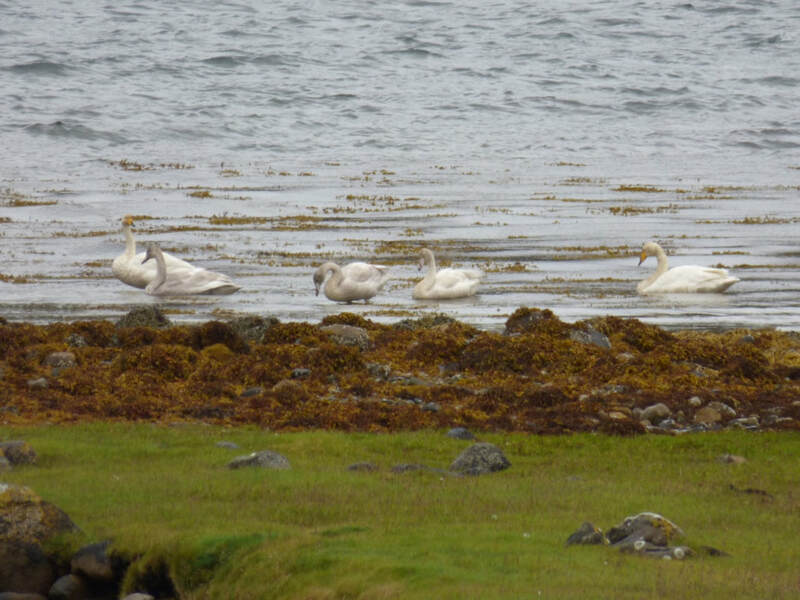 12 Whooper Swans at Lower Milovaig (Bob McMillan). Inverness-shire: Kingfisher at Muirtown Pools. ​Wester Ross: Yellow-browed Warbler along riverside path in Ullapool today (Andy Williams). Exceptional numbers of Sabine's Gulls in Broadford Bay, Skye during strong northwesterly winds. Sutherland: Roller reported again briefly this morning south of the craft village (Birdguides).